For readers who have been following Rome's public betrayal of the Chinese Underground Catholic Church, where Benedict's Letter in 2002 played an important role, a truly shocking announcement was recently made. The Vatican has demanded the retirement of one Underground Bishop and the demotion of another to be replaced by bishops of the communist-controlled Chinese Catholic Patriotic Association (CPA). The latter bishops are appointed by the Communist Regime and they must promise to obey and place it first, before any "foreign powers," that is, the Vatican. AsiaNews disclosed that Bishop Peter Zhuang Jianjian of Shantou, who is recognized by the Holy See, was asked to step aside by a Vatican delegation. He would be replaced by the illicit bishop Huang Bingzhang, who was ordained without Vatican approval by the CPA and thus excommunicated; he is also a long time member of the National People's Congress, China's parliament. The second case is that of Bishop Joseph Guo Xijin, ordinary bishop of Mindong, who was asked to step down and become the auxiliary or coadjutor of the illicit bishop Vincent Zhan Silu. In plain language: The Vatican is abandoning Bishops loyal to the Holy See and replacing them with those loyal to the Communist Regime. According to AsiaNews reports, since October 2017 Bishop Zhuang has refused to resign and be replaced by the pro-communist bishop. For the second time in three months, the Holy See demanded that he resign, but he said he preferred to disobey rather than "violate the dogma and principles of the Church." Then, in late December 2017, he was escorted forcefully to Beijing to meet with the Vatican delegation and government officials. There, he was again asked to resign in order to improve Beijing-Rome relations and unify the Church. He wept; one source said Bishop Zhuang had gone through the most difficult time in his life and felt betrayed. How can such a request not be seen as a betrayal of a heroic Underground Church that has suffered decades of persecution because of its loyalty to Rome? Bishop Zhuang himself has been imprisoned three times by the communists because he would not give his allegiance to the Communist Patriotic Association. It is incomprehensible that Rome is conceding by sacrificing these faithful Bishops under the pretext of" improving relations." As for underground Bishop Guo Xijin who was asked to "voluntarily" step down, he was held a month in custody by the Communist Regime in April of 2017 in order to be "re-educated" by CPA officials. This "instruction" followed part of the new stricter regulations being imposed by the Regime to keep control of religion and adapt them fully to communist society. It remains to be seen whether he was sufficiently "re-oriented" to step down as requested. 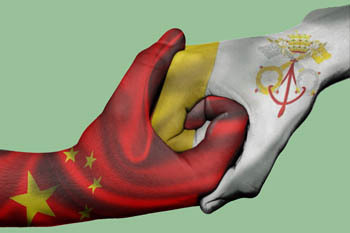 This betrayal of the Vatican is upsetting many Chinese Catholics in the Underground Church. AsiaNews reported one Catholic from the Hebei Province, who asked to simply be called Paul, expressed shock that the Vatican would sacrifice legitimate Bishops in exchange for having good relations with Chinese authorities. "I am afraid that the Holy See has just been led by the nose, allowing itself to be manipulated," he said. "It is shameful for the Church." Paul stressed that the more the Holy See makes concessions, the stronger Catholics should react. "We can neither bow nor compromise. If the Vatican does not live up to expectations, we have to fight for ourselves," he said. Benedict, a Catholic from Shanghai, said that he had lost his faith in the Holy See because of this issue. "The Vatican currently compromises and cooperates with the Red Dragon at all cost," he stated, " giving up the principles of the Church." Another Catholic, John, said faith is not for trade and "the principles of the Church could not be betrayed," but now the Holy See just "betrays those who maintain allegiance to the Church, ultimately submitting to the total control of Satan." Others in the Underground Church have reportedly complained that it had become nothing more than a "pawn in the political game" the Vatican was playing with China and, even more, the true Church had become "a thorn" in Rome's side. If the Vatican gives control to the CPA, another Catholic noted, the Church will be comprised only of those who submit to the Communist Regime, and not the Holy See. "I am disappointed, totally disappointed," wrote one Catholic. "The new Judah has sold his Lord again. The demon is happy! This makes no sense." For many loyal Chinese Catholics, the result of these concessions is the abandonment and ultimate destruction of the Underground Church. On the other hand, it is distressing to report that many bishops, priests and faithful in the Catholic Underground Church will ultimately obey Vatican orders to merge with the Patriotic Association, following their long and deeply ingrained habit of submission and obedience to the Holy See. Catholics today are so accustomed to the support for Communism of the post-conciliar Church that there had been little protest against the abandonment of the heroic and persecuted Underground Catholic Church. For a long time now, the Vatican's obsession with improving relations with China's communist authorities had resulted in one concession after another to Beijing. Benedict XVI took the first significant steps by announcing the need for one Church, encouraging the underground Catholics to unite with the Patriotic Church. He also removed the special permission for the Underground Church to make their own Bishops, thus effectively dooming them to a future without Prelates to ordain priests and administer sacraments. The anti-communist Cardinal Emeritus Joseph Zen seems to be the only one raging. After learning of these requests favoring the illegitimate bishops, he made a trip to Rome to hand a letter to Francis, asking the Holy See to "step back from the precipice before it is too late." But where is the anger of the rest of the Prelates, priests and lay faithful of our Catholic Church? Why is there no reaction to this maneuver that allies the Church with a Communist Regime that has such a brutal and ongoing history of persecution. It makes no sense to destroy the authentic Catholic Church in China. More evidence that Rome is overrun by the agenda of Satan and all his minions. Illuminati masons modernists Luther-ites and on and on. Has errors been spread? Just like Our Lady said Russia will spread her errors. One error is not caring and submission. So I guess.... here we go.